Informal discussion between colleagues on the issue of gender balance of presenters at UK ELT events. After the award ceremony, there was a discussion of what The Fair List is, why it is important and possible future steps. An email list of those interested started. The Fair List email address set up. Domain for a web site registered. Information pieces written for newsletters and web sites, and audio recorded for overseas conference. Meeting with Dr Fiona Bartels-Ellis, Head of Equal Opportunity and Diversity at the British Council, London. The Fair List approached by Katie Quartano for help with suggestions for Europe-based women speakers for the Thrace Macedonia conference. 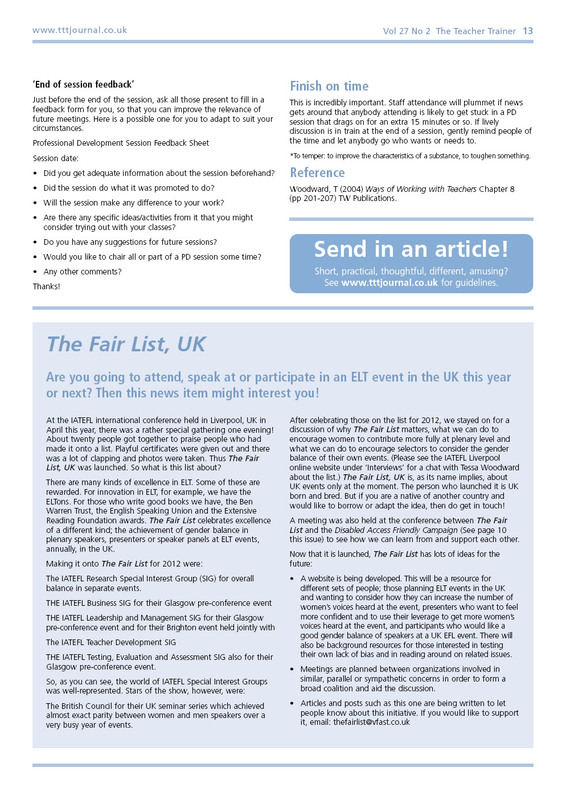 A piece about The Fair List was published in the Summer 2013 issue of the Teacher Trainer Journal. The web site starts to come together. This web site was launched! 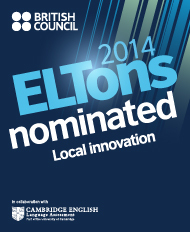 Zsuzsa Kuti, Editor for ELTECS-ECR, posts info on her ELTeCS list and sends it on to her fellow ELTeCS Editors. Nicky Hockly mentioned The Fair List in a recent blog post (point 5 at the bottom of the post). Canterbury Christ Church University for their ‘Cutting Edge’ conference July, 2013. At the awards event, after celebrating the people on the list, the group stayed on to explore a time line of positive events in civil rights for women in the UK over the last 100 years or so. Please see the Radio and Mixed links page in the ‘Resources’ section. Chris Lima posted information about The Fair List, UK Harrogate awards event. Rob Lewis of the British Council English Agenda interviewed Tessa Woodward about The Fair List. The interview is now available as a podcast at: http://englishagenda.britishcouncil.org/podcast. The Fair List ran our first webinar, with the IATEFL Leadership and Management Special Interest Group. It was on ‘Preparing for your first keynote talk or plenary.’ The speakers were Susan Barduhn and Simon Greenall. The event was sponsored by NILE. All those attending the webinar also had the opportunity to put in a proposal for a webinar of their own to Cambridge English Teacher (CET). This is the link: http://iatefl.adobeconnect.com/p6ybav71815. Daniel Zuchowski included news of The Fair List in the Resources section of the September issue of the ELT Ireland newsletter. The British Council, English Events team agreed to sponsor mentor and mentee packs or web site pages to be used when we get a mentoring scheme going. A call was put out for ideas for mentoring resources and much useful material was received. Paul Braddock, the TeachingEnglish Website Manager for The British Council, uploaded the story of The Fair List to the TeachingEnglish web site, promoted it via their newsletter and also on their social media channels. Their Facebook page has around 3 million likes and a lot of engagement, so this was a very effective way to promote The Fair List. Thanks Paul! 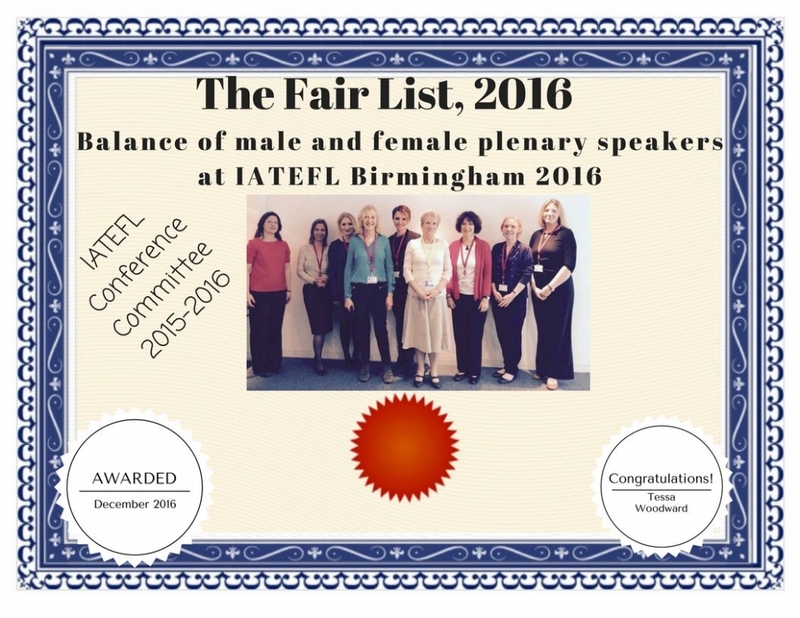 Marjorie Rosenberg, incoming IATEFL President, mentioned The Fair List in an article in the EL Gazette. IATEFL Business English Special Interest Group for their pre-conference event at Harrogate. IATEFL Learning Technologies Special Interest Group for their pre-conference event at Harrogate. IATEFL ESP Special Interest Group for their pre-conference event at Harrogate. IATEFL Teacher Training and Education Special Interest Group for their pre-conference event at Harrogate. IATEFL Learner Autonomy Special Interest Group for their pre-conference event at Harrogate. New Mentoring scheme is launched to support first time women plenary/ keynote and panel speakers at UK ELT events. The C group re-posted one of our blog posts on their web site. You can see it here. Tessa Woodward, Founder of The Fair List, UK was invited to speak about the list at the British Council on International Women’s Day. The talk was live streamed to other British Council offices. IATEFL ‘How to…sessions 2013, 2014, and 2015! eflmagazine.com carried an article about the IATEFL Birmingham event with photos. Thanks guys! IATEFL Learning Technologies and Young Learners and Teenagers Special Interest Groups for their joint pre-conference event at Birmingham conference. IATEFL ESP Special Interest Group for their pre-conference event at Birmingham conference. IATEFL Teacher Development Special Interest Group for their pre-conference event at Birmingham. Following co-operation between The Fair List, UK and the Women in ELT Facebook page and group, a new group of mentors has been added to our mentor list. Please see the Mentoring pages for details of this group of experienced speakers willing to support others. Christine Barker volunteered to set up and administer a Facebook page for us!